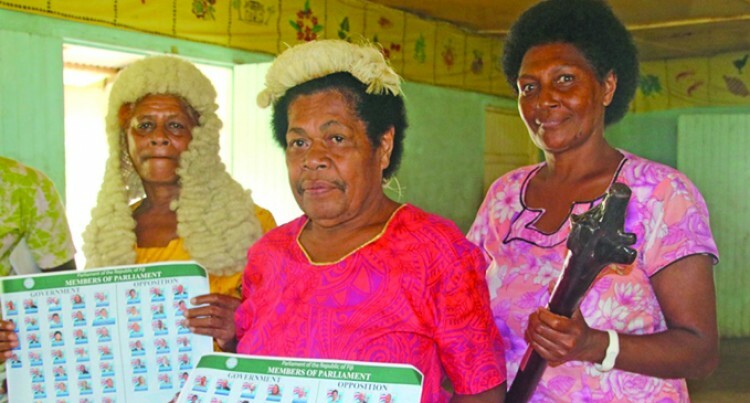 Some women of Nadroga-Navosa have sounded the need for more Parliament edu­cation programmes for rural dwellers to help them better understand the institution. This was made known to the Parliament out­reach team while conducting the “Parliament Bus” programme in some villages in the prov­ince last week. Speaking on behalf of the women, Nalebaleba villager Iliseva Nakai said rural dwellers were usually deprived of the opportunity to visit Parliament or even watch the live sitting on tel­evision because of problems such as the lack of transportation and electricity supply. “Due to our geographical location, most of us hardly come to the main centres, let alone have access to electricity and these are some of the reasons we don’t know about Parliament,” she said. “We don’t even understand about what happens in Parliament and because of this most of us continue with their normal lives daily in their respective villages, paying less attention to the proceedings in Parliament. “But now, after this programme, we are so for­tunate to have been enlightened for the first time about the roles and functions of Parliament. “Apart from that we also learned how we can engage with the institution and other important information. Fellow villager and headman Mosese Gere said rural dwellers needed to be frequently visited by the Members of Parliament. “Some of us don’t even know all the Members of Parliament and how we can engage with them to ensure our voices are heard,” Mr Gere said. “We are remotely located and it’s difficult for most of us to visit Parliament. “If the MPs can visit us every once in a while, this would really mean a lot to us. Meanwhile, the team visited Vatubalavu, Wema, Draiba, Keiyasi, Jubairata, Nalebaleba, Dreke, Koronisagana, Malomalo, Nawamagi, Lomawai and Lawai villages as part of the pro­gramme last week.